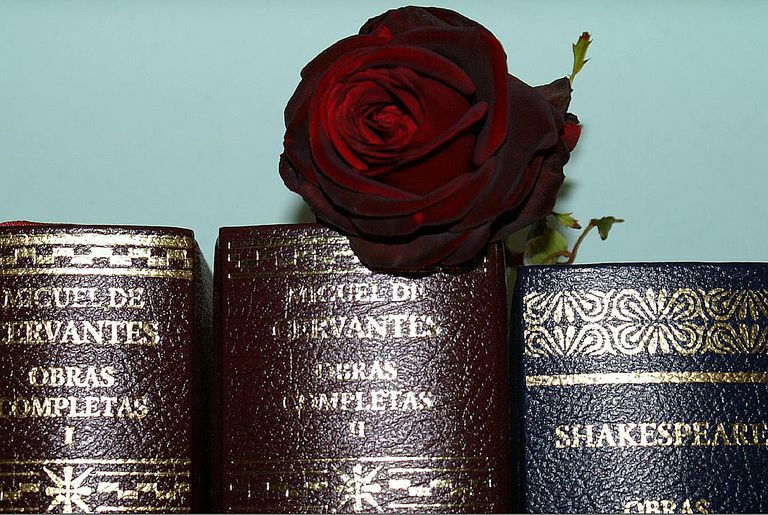 Works of Cervantes and Shakespeare share a bookshelf. Ferran Pestaña / Creative Commons. In one of those coincidences of history, two of the Western world's leading authors — William Shakespeare and Miguel de Cervantes Saavedra — died on April 23, 1616 (more on that soon). But that's not all they had in common, for each was a pioneer in his field and had a long-lasting influence on his language. Here's a quick look at the ways in which these two writers were similar and different. Keeping records of birth dates wasn't nearly as important in 16th-century Europe as it is today, and therefore we don't know with certainty the exact date when Shakespeare or Cervantes was born. We do know, however, that Cervantes was the older of the two, having been born in 1547 in Alcalá de Henares, near Madrid. His birth date is usually given as Sept. 19, the day of San Miguel. Shakespeare was born on a spring day in 1564, presumably in Stratford-upon-Avon. His baptism date was April 26, so he probably was born a few days before then, possibly on the 23rd. While the two men shared a date of death, they didn't die on the same day. Spain was using the Gregorian calendar (the one in nearly universal use today), while England was still using the old Julian calendar. So Cervantes in fact died 10 days ahead of Shakespeare. It's safe to say that Cervantes had the more eventful life. He was born to a deaf surgeon who struggled to find lasting work in a field that was low-paying at the time. In his 20s, Cervantes joined the Spanish military and was seriously injured in the Battle of Lepanto, receiving chest injuries and a damaged hand. As he was returning to Spain in 1575, he and his brother Rodrigo were captured by Turkish pirates and subjected to forced labor. He remained in custody for five years despite repeated attempts to flee. Eventually, Cervantes' family drained its resources in paying ransom to liberate him. After attempting and failing to make a living as a playwright (only two of his plays survive), he took a job with the Spanish Armada and ended up being accused of graft and jailed. He was once even accused of murder. Cervantes finally achieved fame after publishing the first part of the novel El ingenioso hidalgo don Quijote de la Mancha in 1605. The work is usually described as the first modern novel, and it was translated to dozens of other languages. He published the remainder of the work a decade later and also wrote other less well-known novels and poems. He did not become wealthy, however, as author royalties were not the norm at the time. In contrast with Cervantes, Shakespeare was born into a wealthy family and grew up in the market town of Stratford-upon-Avon. He made his way to London and was apparently making a living as an actor and playwright in his 20s. By 1597, he had published 15 of his plays, and two years later he and business partners built and opened the Globe Theatre. His financial success gave him more time to write plays, which he continued to do until his early death at age 52. Living languages always evolve, but fortunately for us, both Shakespeare and Cervantes were authors recently enough that most of what they wrote remains understandable today despite changes in grammar and vocabulary during the intervening centuries. Shakespeare undoubtedly had a greater influence in changing the English language, thanks to his flexibility with parts of speech, freely using nouns as adjectives or verbs, for example. He is also known to have drawn from other languages such as Greek when it was useful. Although we don't know how many words he coined, Shakespeare is responsible for the first recorded use of around 1,000 words. Among the lasting changes he is partly responsible for is the popular use of "un-" as a prefix to mean "not." Among the words or phrases we know first from Shakespeare are "one fell swoop," "swagger," "odds" (in the betting sense), "full circle," "puke" (vomit), "unfriend" (used as a noun to refer to an enemy). and "hazel" (as a color). Cervantes isn't known so much for enriching Spanish vocabulary as he is for using sayings or phrases (not necessarily original with him) that have endured and even become parts of other languages. Among those that have become part of English are "tilting at windmills," "the pot calling the kettle black" (although in the original a frying pan does the talking), and "the sky's the limit." So widely known became Cervantes' pioneering novel that Don Quijote became the source of the English adjective "quixotic." (Quixote is an alternative spelling of the title character.) The Spanish equivalent is quijotesco, although it more often refers to personality than does the English word. Both men became closely associated with their languages. English is frequently referred to as the language of Shakespeare (although the term is often used to refer specifically to how it was spoken in his era), while Spanish is often called the language of Cervantes, which has changed less since his era than English has. Did Shakespeare and Cervantes Ever Meet? As so whether the two playwrights crossed paths, the quick answer is not that we know of, but it's possible. After twins were born to Shakespeare and his wife, Anne Hathaway, in 1585, there are seven nonconsecutive "lost years" of his life for which we have no record. Although most speculation assumes that he spent his time in London perfecting his craft, fans have speculated that Shakespeare traveled to Madrid and became personally acquainted with Cervantes. Although we have no evidence of that, we do know that that one play that Shakespeare may have written, The History of Cardenio, is based on one of Cervantes' characters in Don Quijote. However, Shakespeare would not have needed to travel to Spain to become familiar with the novel. That play no longer exists. Because we know little about the educations that Shakespeare and Cervantes received, there also has been speculation that neither wrote the works attributed to him. A few conspiracy theorists have even proposed that Shakespeare was the author of Cervantes' works and/or vice versa — or that a third party, such as Francis Bacon, was the author of both their works. Such wild theories, especially regarding Don Quijote, seem far-fetched, as Don Quijote is steeped in Spain's culture of the time in a way that a foreigner would have found difficult to convey. Noted writers William Shakespeare of England and Miguel de Cervantes of Spain lived at the same time—they died on the same calendar date—but Cervantes was born about 17 years earlier. Both men had an enormous influence on their respective languages. It is unknown if the two men ever met, but "missing years" in Shakespeare's life makes that a possibility.